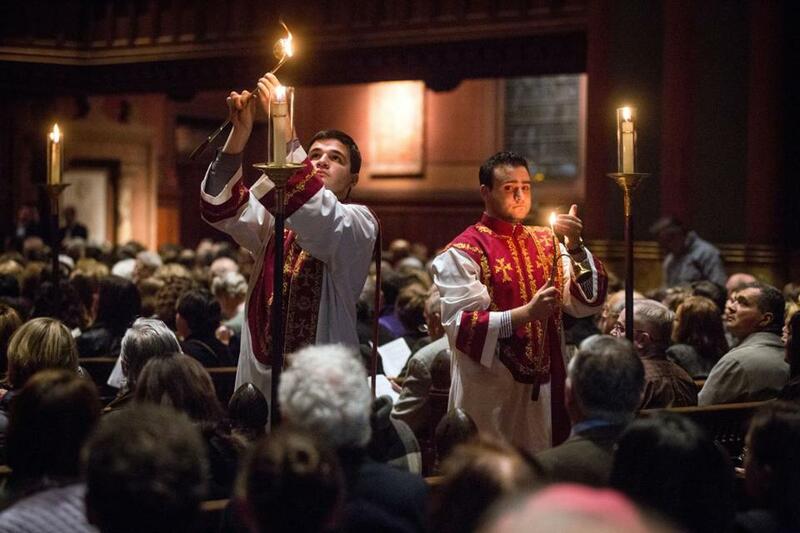 Candles were lit at the Armenian Genocide services held at Trinity Church in Boston. Small white luminaries, set in rows on the steps of Trinity Church in Copley Square, glowed in the cold wind. Written on some were names: Marnos Kashmanian. Flora Asatur. Yervant Samoorian. Christian leaders from various traditions led an Armenian vespers service Thursday evening at Trinity Church in Copley Square to commemorate the 100th anniversary of the killings of 1.5 million Armenians by Ottoman Turks. The service — whose leaders included Orthodox, Roman Catholic, Protestant, and Armenian church leaders, and whose speakers included representatives of the Jewish and Muslim communities and Governor Charlie Baker — underscored widespread solidarity in Boston with the Armenian community in its long quest to gain recognition of the massacres as a genocide. The Rev. Krikor Sabounjian of the Armenian Church of the Holy Translators in Framingham said in an interview that the diverse gathering was a momentous occasion for the state’s diaspora, which is the second largest in the nation. President Obama, like his predecessors in the White House, has refused to recognize the mass slaughter as genocide for fear of offending Turkey, a key US ally at a time of extraordinary turmoil in the Middle East. Turkey says that the number of Armenians killed has been greatly exaggerated and that the killings were part of a civil war between Muslim Turks and Christian Armenians, with victims on both sides. Though they are deeply disappointed in Obama, Armenian-Americans say they have drawn comfort from Pope Francis’s use of the term genocide to describe the killings. 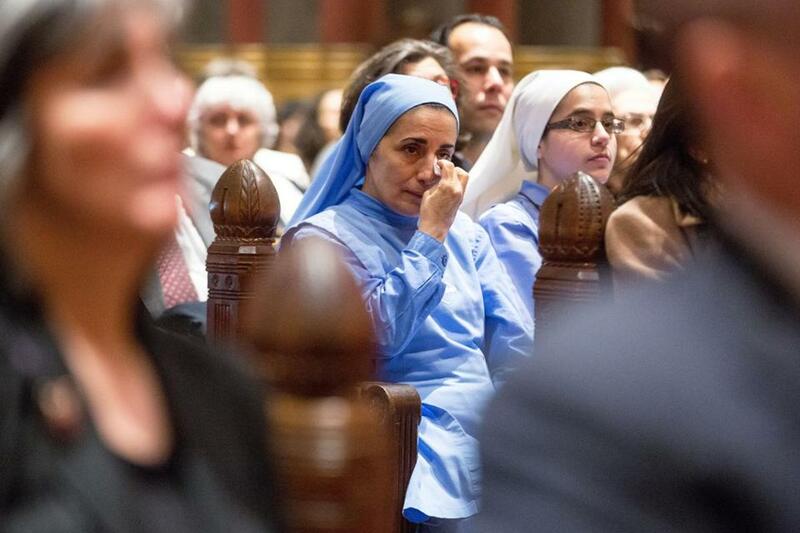 A woman wiped away tears at a service at Trinity Church in Boston on Thursday. Archbishop Jean-Clement Jeanbart of the Melkite Archdiocese of Aleppo, Syria, spoke poignantly of the death and destruction the people of his city have suffered. “I ask the world to pray with me that the war will end in Syria as soon as possible, and that . . . those who left will come back,” he said. The offering at Thursday night’s service will be sent to aid people of all faiths in Aleppo who are suffering the disastrous effects of civil war, said Anthony Barsamian, one of the organizers. Earlier Thursday, the Armenian Church canonized the genocide’s victims at the Etchmiadzin Cathedral, its mother church in Armenia. It was the first time in centuries the church has created new saints. James Kalustian, an archdeacon in the Armenian Church and a member of its highest advisory body, said the canonization means that virtually all Armenian-Americans in Boston are now descendants of saints. Most Armenians arrived in Massachusetts as a direct result of mass killings, he said. Heather Apigian Krafian, 49, pondered how the canonizations would affect her life and faith after a service at St. Stephen’s Armenian Apostolic Church in Watertown on Thursday. As it ended, she and other parishioners heard the church bells pealing, echoes of bells ringing around the world in simultaneous recognition of the new saints. She was thinking of her grandfather, Hagop Madoian, who was 11 when his parents were driven away to their deaths. In a journal account in 1923, Madoian wrote that he was overjoyed when he found his 9-year-old sister in an orphanage some time later. Mariam, lack-eyed, rose-cheeked, and clever, cried day and night for her parents. One day, she excused herself from breakfast and went back to sleep. He saved her portion of soup for her, but hours later, he discovered she had died in her bed. He buried her himself in a neighboring churchyard. Krafian takes some comfort in knowing that, now, little Mariam is a saint. And one day, she believes, Turkey will have no choice but to acknowledge what really happened. Lisa Wangsness can be reached at lisa.wangnsess@globe.com.